On May 10 we were awarded Platinum honors for the third straight year from Jacksonville’s First Coast Worksite Wellness Council and the Mayor’s Council on Fitness and Well-Being. The First Coast Healthies Company Award was designed to commend and formally recognize companies and organizations of all sizes for their commitment to improving employee health and wellness. For the past nine years we've been a recipient of the award. Our Human Resources team is instrumental to the wellness program's success. 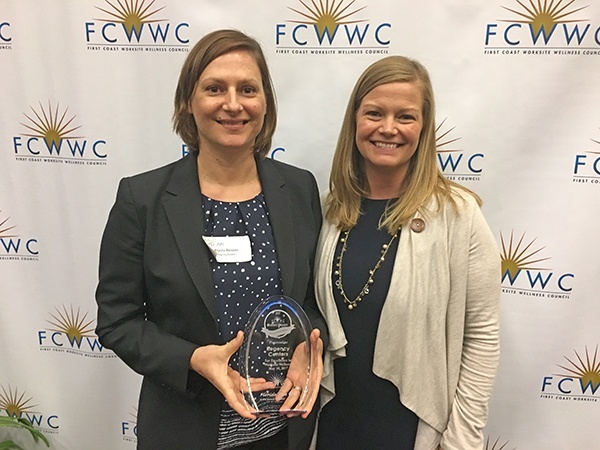 "Regency continues to provide a best-in-class wellness program being awarded highest honors through First Coast Worksite Wellness Council," said Reese Dowell, Senior Compensation & Benefits Analyst. "We take pride in our wellness program offerings targeting our education and communication based on aggregate biometric screening results to improve overall employee health." This year's event took place at University of North Florida's University Center. Other local platinum award winners include Acosta Sales & Marketing, Availity LLC, Baptist Health, Brooks Rehabilitation, Crowley Maritime Corporation, CSX Transportation, Family Care Partners, First Coast YMCA, Florida Blue, Florida Health Care Plans, Harden, Health Designs, Humana, Jacksonville Port Authority, Johnson & Johnson Vision Care, Stellar, UF Health Jacksonville and University of North Flirida.